Liaison psychiatry team lead Nicola Wood has significantly improved the hospital experience for patients with dementia and their carers by slashing the number of moves they experience. A nurse has significantly improved the hospital experience for patients with dementia and their carers by slashing the number of moves they experience, and by ensuring clinically necessary moves are made earlier in the day. Liaison psychiatry team lead Nicola Wood’s collaborative approach is enabling nurses to reduce the risk of delirium and distress. Ms Wood, who works at Forth Valley Royal Hospital in Larbert, Scotland, says: ‘Delirium is associated with poor outcomes, including increased length of stay, long-term reduction in functional ability and increased mortality. Ms Wood became concerned that older people with dementia were being moved unnecessarily and, on investigating, found half of all moves took place after 8pm, with 10% after midnight. One third of patients were experiencing two or more moves. One person had experienced seven moves in five days. ‘Once I had seen what was happening, I could not ignore it,’ says Ms Wood. ‘But I was a bit naïve. I thought I could simply ask people to stop moving patients and the job would be done. I soon realised it would be a massive job requiring a whole-systems approach. A root-cause analysis showed that patients with dementia were not being highlighted for the patient flow team when they were admitted. The liaison psychiatry team began providing the patient flow team with a daily list and highlighted the names of patients with dementia on the multidisciplinary team board. The patient flow team began keeping a log of patients who had been moved late in the day. ‘We looked at the common themes and shared learning, and any moves after midnight were reported and fully investigated,’ says Ms Wood. Freeing beds earlier in the day in downstream wards was crucial, as was improving the discharge lounge. ‘I liaised with local health authority managers and social work departments to see if there was any way we could start discharge packages of care earlier in the day,’ Ms Wood says. For the first two months of her project Ms Wood worked hard to get people on board. She explains: ‘Staff had reported feeling frustrated about patient flow. It was a matter of getting to know the different staff members and explaining the benefits to them, one by one. Tailored education and awareness sessions for staff had a significant effect on the project’s results, which are impressive. Year on year, the number of people moved before 8pm has risen from 52% to 92%, while those requiring two or more moves has fallen from 33% to 2%. The number of patients moved after midnight has been reduced dramatically. Meanwhile, staff report they are more confident in advocating for patients. NHS Forth Valley director of nursing Angela Wallace says she is ‘truly impressed’ with Ms Wood’s commitment and dedication. Ms Wood was highly commended in the Nursing Older People category of the prestigious RCNi Nurse Awards 2017. Chair of the RCNi editorial advisory board and judge Caroline Shuldham says: ‘Nicola recognised the detrimental impact that being moved frequently and late in the day has on people with dementia. Maintaining improvements is not easy, says Ms Wood, but it proved sustainable over winter. To raise awareness, she sends a monthly report of the moves experienced by patients with dementia. ‘If there has been a dip, senior managers and consultants try to motivate their teams. But generally, the dips correspond with how busy the hospital is. ‘If it is 9pm and the alternative is leaving them to try to sleep in the emergency department, we move patients. But when we have investigated late moves we have found they were undertaken for the right reason – clinical indication. Because of its success, the project has been extended to include patients with delirium. One of the most important factors in the initiative’s success has been carer and patient involvement. ‘My advice to anyone considering starting a similar project would be to include patients and their carer where you can,’ says project lead Nicola Wood. Ms Wood has developed links with the local carer’s centre in Falkirk and now makes twice-yearly visits. 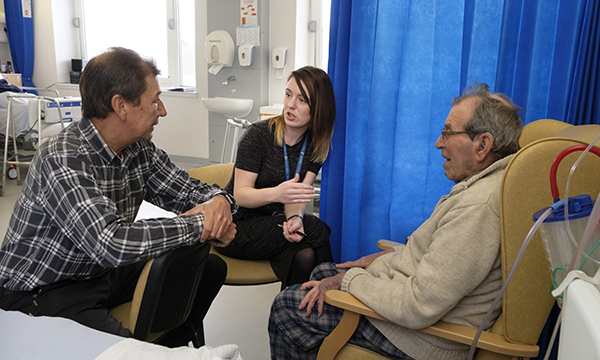 When Ms Wood first visited, the concerns raised by carers drove her to improve the hospital journey for patients with dementia and to minimise the number of patient moves. ‘They highlighted this as an area in which they were unhappy with their experience,’ she says. Ms Wood built on the initial visit to explain what the hospital was trying to do to improve the experience of patients with dementia or cognitive impairment. ‘I realised that we were getting good information about what was important to the carers and patients, and what they would like to see to improve their hospital admissions,’ she says. On her last visit in February, Ms Wood had a different experience from 18 months previously. The carers had no negative feedback and several reported that, when patients were transferred to different parts of the hospital, their carers could accompany them. Ms Wood says it is reassuring to hear that carers are feeling the difference.